Looking back on a memorable career, Darren McCarty recounts his time as one of the most visible and beloved members of the Detroit Red Wings as well as his personal struggles with addiction, finances, and women and his daily battles to overcome. 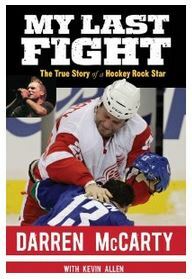 Darren McCarty's autobiography My Last Fight: The True Story of a Hockey Rock Star is due out in the fall of 2013. It is written with Kevin Allen. As a member of four Red Wings’ Stanley Cup–winning teams, McCarty played the role of enforcer from 1993 to 2004 and returning again in 2008 and 2009. His “Grind Line” with teammates Kris Draper and Kirk Maltby physically overmatched some of the best offensive lines in the NHL, but he was more than just a brawler: his 127 career goals included several of the highlight variety, including an inside-out move against Philadelphia in the clinching game of the 1997 Stanley Cup Finals. As colorful a character as any NHL player, his arms are adorned with tattoos, and he was the lead singer in the hard rock band Grinder during the offseason. Yet this autobiography details what may have endeared him most to his fans: the honest, open way he has dealt with his struggles in life off the ice. Whether dealing with substance abuse, bankruptcy, divorce, or the death of his father, Darren McCarty has always seemed to persevere.